Matthew, Mark, Luke and John...the first four books of the New Testament tell us the story of Jesus - and more importantly the good news of salvation. From his birth in a humble manger, to his ministry and miracles and finally his crucifixion and resurrection, these four books hold the answers to life's questions. Spread the Gospel to everyone on your mailing list when you choose these Christian return address labels from CheckAdvantage. They give you a faith-filled finishing touch for all your letters and packages. Plus, you'll save a considerable amount of time as well. A self-adhesive backing makes a tiresome chore quick and easy. 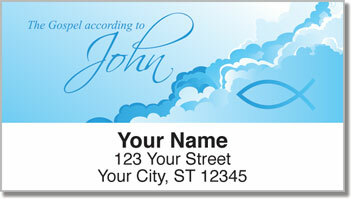 Order your own The Gospel Address Labels right now! Get them with a set of matching checks.